Affordable Luxury-Large and Well Appointed-Fasted Wifi Available-SLED! 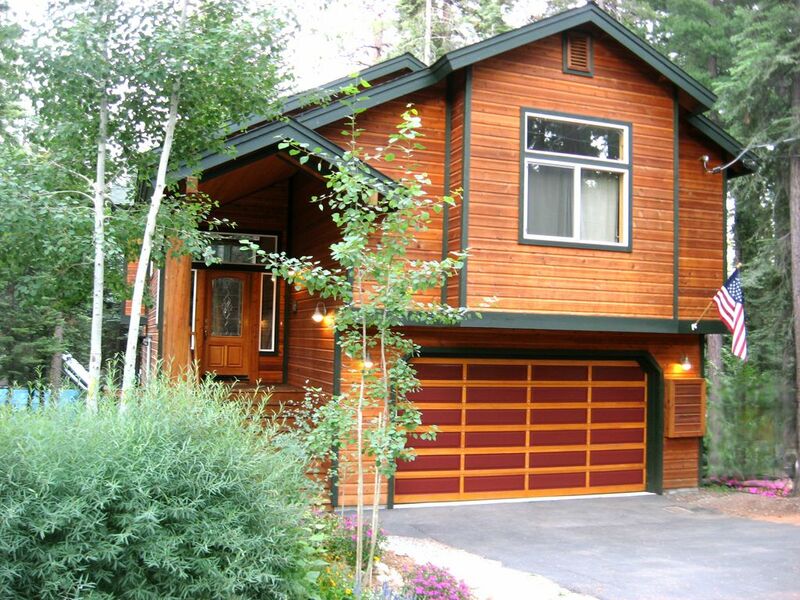 Enjoy all the comforts of home and the beauty of Tahoe's West Shore in this newer 2,300 sqft. peaceful Tahoma space. Welcoming great room with river rock fireplace, exposed vaulted wood-lined ceiling and 360° of natural light. Well stocked designer kitchen with granite counters stainless appliances and walk-in pantry. FASTEST WiFi available with 51 Mbps rated upload speed via EERO routers for smooth streaming of movies/series with Netflix, HBOGO and Amazon Prime. DVR cable HDTV and DVD also available. Stereo with blue tooth connection and for those with older iPod/iphone, 30-pin docking station. Custom art work, games and puzzles for family entertainment. Spacious master suite features pitched ceilings, super comfortable king-size sleigh bed, two large reading chairs, six foot jetted tub, separate shower and dual vanity sinks. Cozy second bedroom with pine log queen bed. Third bedroom with log pole bunk beds and convertible daybed which coverts to to king-size or two twins. Separate family room with queen sleeper and HDTV. Large second bathroom with dual vanity. Quality furniture, linens and amenities. Large two-car garage with opener. Summer offers endless bike and hiking trails. Close to Chambers public beach and a short three-mile drive to one of Tahoe's most beautiful beaches at Meeks Bay, featuring various water rentals, a snack bar and free air station for your inflatables. In the afternoon, enjoy a lazy five mile raft trip down the Truckee River from Tahoe City ending at the River Ranch Restaurant. Weber natural gas grill and deck dining. Stroll to the homeowner's pier on the lake for breath-taking sunsets. Winter: Gentle sloping lot allows up to 100' sled run on the property. Heated closet to keep your jackets and boots warm and dry. Adjacent Sugar Pine park with groomed 1960 Olympic XC ski trails and miles of snow shoeing area. 3 miles to Homewood Ski which offers great terrain, discounted skiing for kids and the most spectacular views of the lake of any ski resort in the Tahoe Basin. Short drive to Squaw Valley/Alpine Meadows home of the 1960 Olympic Games, restaurants and activities. Easy communication direct with owner via phone, text or email. “Thanks for making our stay a 5 star experience”. “We had a great time. Skied 5 different mountains - all good. Your house was perfect. We usually ski Colorado in spring and have rented various condos/homes at all major resorts; yours was one of the best. Beautiful, comfortable, quiet and well stocked. Growing up, my family had a cabin in South Tahoe. I am forever grateful for my parent’s hard work and efforts to support a vacation home. From that cabin we would typically drive 20-40 minutes to spend a summer’s day at a desirable beach. As an adult, my wife and three children did the same routine in summer and made the 40 minute drive to ski Kirkwood in winter as it was more kid friendly than Heavenly just blocks away from our cabin. When the opportunity came to purchase our own vacation home, we wanted a location that was less crowded than South Shore, would place us near a wonderful beach and an intimate ski resort. We found it in Tahoma. With Meeks Bay beach and Homewood Ski resort just 3 miles from the house, bike and hiking trails accessible without using the car, we couldn’t be happier with the location and the house is fantastic. We wish to share our experience and hope you come to call our house your vacation home. Our house has a wonderful feeling the moment you walk through the door. The great room with 360° natural light and tree views. Quality furnishings, bedding and amenities create the comfort expected at your own home. A Weber Genesis natural gas BBQ for quality summer meals to enjoy on the comfortable deck table. We have easy access to both ski and beach, hiking and biking trails. We are the only rental property in Tahoma boasting an on-property sled run. Beautiful home, very spacious and a lot of natural light. Nicely decorated, great kitchen with everything you'll need. The host is very attentive and responsive. We rented this cabin the first week of the new year. The cabin is super clean, cozy and Brian was a great host. Having a garage was a huge benefit during the winter. We could get in and out of the car without getting snowed on. There is room on the property to make a small sled hill and build a snowman. We really enjoyed the property and would definitely go back. The only negative thing I have to say (to get it out of the way and I feel like it's misleading) is that there really isn't a "sledding hill" next to the house. There is a little slope in the ground on one side that someone could ride a sled down if they could avoid the tree and porch posts.... That said, you can go out and play in the snow when it snows, just don't plan on making a day of sledding without leaving the house and don't make that part of your decision to stay here. Everything else was as advertised and expected, 3 bedrooms, 2 1/2 bathrooms, bunk beds in one downstairs room, washer and dryer and the "drying room" closet were pluses for us. Great big tub for our little one to "swim" in.... wonderful open kitchen and living space. Some odd things like taking pillow shams off before using pillows- just don't put them on if they are not to be used?? Both thermostats are upstairs and you have to kind of play a game with the fireplace and furnace temp settings to use the fireplace without making the downstairs FREEZING. The garage was large enough to fit our rental 4wd Suburban, so that was a huge plus. Thanks for your feedback Rhiannon. When we have average or better snow fall, the plow from the street and our driveway blows and piles snow adjacent to the Quaking Aspen giving a 6-8’ high launch pad to head along the left side of the house (you can see the photo on the site showing the snow level in the front, well above the porch height) After some grooming compacts the snow which we usually run all the way to the back lot line. We’ve even had guests create turning banks on the adjacent lot for more verity. It appears due to the below-average snow levels during your stay end of 2018, the availability to create the sled run was limited. Fortunately, Mother Nature has been kind as I’m writing this 1/6/19 with 2+ feet of fresh snow expected from the current storm and more to come. Regarding the pillow shams (covers), my wife really like them so I have no power over that. We do try to inform guests of using the fireplace, but this is the condition in most rentals with gas fireplace that produce heat and not just pretty fire effect. Perhaps I should edit our House Instructions to be more clear. 1. Fireplace is operated by thermostat to the left. This produces significant heat. Do not place clothing or boots to dry, they will be singed. Turn off the fireplace at bed time. HINT: The fireplace keeps up stairs warm but also reduces the amount of heat from the central heating system. This causes down stairs to get a little chilly. Turn off fireplace one hour before bed time if the lower level is being used to allow the central heat to kick in. Thanks again for your stay and glad you and your family had a wonderful stay. I could have stayed the entire time in the master suite! So clean and spacious...we will be back! It was a great place for our family vacation. The property was clean and organized. It had everything needed for kitchen use, bathrooms , bedding and the beach . Brian was great about communicating with any kind of issue, which there were none ! Thanks for sharing you beautiful Tahoma home . It's Lake Tahoe, what more do you need!